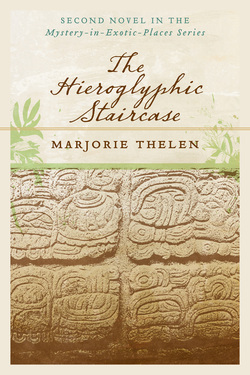 Elena Palomares’ archaeological project in Copan, Honduras turns menacing when she discovers someone has been stealing stones from the Hieroglyphic Staircase, she finds a stranger dead at her work site, and she’s a suspect in the murder. Help from Dominic Harte, a man haunted by his past, pulls him into the murder investigation. But Elena pays the price trying to solve the mystery -- she’s kidnapped by the murderer who tries to silence her and the little boy destined to solve the crime. intricately carved stones have begun to disappear from the staircase she’s studying in Copan Ruinas, she finds a dead stranger at the site. As the body count rises, and officials eye Elena for the crimes, she can’t shake the suspicion that she’s stumbled onto an antiquities-smuggling ring—one that she and another witness, a boy called Flaco, unfortunately know too much about. Luckily, they have the support of a new friend: Dominic Harte, a former Episcopal priest who volunteers at Copan’s new medical clinic. Sparks fly between Elena and Dominic, and the danger escalates. Thelen knows Copan first-hand—her dedication thanks the Honduran friends who introduced her to it—and her familiarity with local plants, customs, and language enriches the story immeasurably. Dialogue may sound stilted at times (“Dominic has become a pillar for me over these trying few days,“ Elena tells her mother ), but Thelen’s rendering of Copan consistently feels spot-on, from the way Elena gets around on scooter taxis and fends off the Latin machismo of motorcycle-riding Rolando, to the endless cups of café con leche and homemade soups doña Carolita, Elena's host, uses to comfort her, to the abundant bougainvillea, lantana, and gardenia blossoms. She even incorporates local Spanish. And Thelen doesn’t just home on Copan’s alluring aspects: Elena visits shanty towns such as San Lucas and San Pedrito, with their corrugated metal roofs and scrawny dogs lapping filthy water out of potholes, and the plot turns on the testimony of Flaco, an orphan who lives under the bridge outside the Archaeological Park. Thelen’s affection for rural Honduras, for its natural beauty, generous people, and superstitions (Mayan ghosts loom large), is contagious: This simple mystery spreads the travel bug and satisfies thanks to its intoxicating focus on place. "Marjorie, I finished your book about three hours ago. Once I picked it up it was difficult to put down. I thoroughly enjoyed the book front to back. I was very impressed with the way you were able to project a visual affect with your words. Let me see if I can explain this better. Of all the noted authors I have read, Larry McMurtry, Craig Johnson, Tony Hillerman and many others, who have that ability, you did a magnificent job of portraying every character and all the places where I could just imagine, or close my eyes and picture myself being in the story. It was really enjoyable. I have read some books where the author does not have that ability to transcend the reader from the comfort of their favorite chair to being present as the story unfolds. You did an excellent job. I enjoyed every chapter of the book and was sad when I got to the last page. I thought the continuity of each chapter flowed perfectly from page to page. Thank you. I am looking forward to purchasing the book and hopefully obtain your autograph. Ron"